The perfect wardrobe. 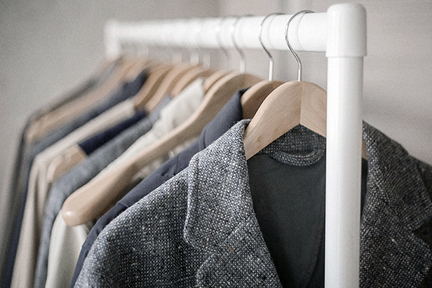 Wooden hangers and a grey palette. Try this yourself! Set up a rail in your room and make it your living inspiration board. 1. Keep all of your new items there and only move them to your other closet after they’ve been worn at least once. This will ensure you wear everything you buy and if you don’t wear it you can figure out why. I’m looking at you purple shirt with puffy sleeves. You were a lapse in judgement. 2. Rotate the remainder of the items based on season and your current color inspiration. 3. If you’re super advanced and ya know don’t have a full time job or basically anything else to do, set up outfits for easy grab & go. From left to right hang a pant, a tank, a shirt, and an outerwear piece all in a row. For extra work, hang corresponding jewelry around the hook. It will remind you to at least attempt to be more adventurous. We tend to choose our old stand-bys when we’re in a hurry. When we have more time, we can think about the things we really want to wear. Doing this in advance will help you avoid a rut.